Whether they’re participating in contact sports like football or basketball, or non-contact sports like baseball and soccer, a properly fitted sports mouthguard is recommended by the American Dental Association (ADA). 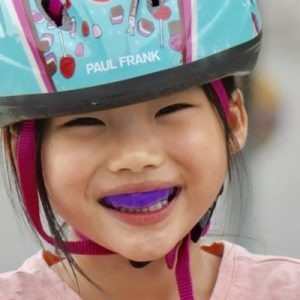 You might wonder what kind of mouthguard is the right fit for your child, and where you should get it. There are three types of mouthguards: the stock mouthguard, the “boil-and-bite” mouthguard, and custom mouthguards made by a dentist. The custom mouthguard provides the best fit and protection, but in the past, it was the least popular option due to its high cost, time-consuming visits to the dental office and sometimes uncomfortable impression procedure. The good news is, the process for fitting custom mouthguards has changed for the better. Let’s look at how it’s evolved. When fabricating a custom mouthguard, a dentist starts by selecting an impression tray that is slightly larger than the teeth arch. The impression material is mixed by hand or a machine, and then loaded into the tray and placed in the mouth. It takes about 1-3 minutes for the material to set, and during that time, the patient can be quite uncomfortable as nasty-tasting materials can flow down the back of the throat. Once the material has set, the impression is removed and sprayed with disinfectant. The plaster model needs to be poured within 30 minutes to avoid distortion. After a few hours, the model can be safely removed from the impression mold. It’s an old-fashioned process that can be labor-intensive. It requires skilled technique, creating potential room for human error and cross-contamination. Modern dentistry has evolved to make dental procedures like taking impressions for mouthguards much easier for the patient. Taking impressions at any age is no longer stressful. The bulky impression trays of the past have given way to the small hand-held wands we use to take a 3D digital impression of teeth today. With this new technology, it only takes 30 seconds to scan the entire arch of teeth. We can even stop and resume the scanning process seamlessly if a child needs a break. As soon as the scanning is completed, a 3D model is created and sent wirelessly to a 3D printer. This state-of-the-art technology not only simplifies and speeds up our workflow, it eliminates any chance of possible cross-contamination that can occur when handling traditional plaster models. That’s all it takes to take a full digital impression of teeth in just 30 seconds, to ensure the closest mouth guard fit and best protection possible. We can also fit clear retainers and nightguards with this procedure. Digital dentistry has made taking mouthguard impressions quick and easy, and the good news doesn’t stop there. Today, there’s no reason why mouth guards need to be boring. We can tailor sports mouthguards in team colors or print your team logo or name on them. Your team will look fierce when facing the competition! What if I’m too Busy to Bring My Child in? Not a problem! Our trained Dental Assistants can bring our wireless handheld scanner to your child’s sports practice. Please share with other parents and coaches about this convenient service North Seattle Pediatric Dentistry provides. We offer a great group discount for your sports teams to make it affordable for everyone. Are you interested in learning more about how a custom-fit mouth guard can protect your child and their teammates? Get in touch with us now to get started!